Beautorium offers a carefully hand-picked selection of the best in natural and organic beauty from around the world. Our brands are trusted, elegant and effective. We’ve done the editing so you don’t have to! Trying to avoid a particular substance? We include a full list of ingredients for every product so you can make an informed choice. Want even more info? View certifying organizations and descriptions. We explain how each of our products meet our criteria using a unique Good to Know system which summarizes the information we know is important to you. Are they certified natural or organic? What are the effective ingredients? How does the company give back to the community or the environment? Try our products first with Beautorium’s Sample Program. Beautorium knows sometimes it’s hard to choose which product is right for you. That’s why we’re pleased to offer our sample service. Choose any four samples from a collection of our most popular lines for only $10.00 to cover postage and handling. Better still, we’ll give you your $10.00 off on your first order. So you’ve nothing to lose by trying before you buy! To discuss your personal sample recommendation, call us toll-free at : 866 557 2243 and ask for Advice. Shopping Beautorium is pretty, simple and smart. Our home page is easy to use, clean and uncluttered. Our brand pages give you an honest, straightforward overview of the benefit, why you should believe it, and the personality. We want to help you to “get-it-at-a-glance”. No excess packaging! 100% Satisfaction Guaranteed. If you are ever unhappy with any product purchased from us, simply return it within 60 days and we will refund your money. Free natural Beautorium bag with every order! Made of fair-trade burlap it’s a must-have accessory. The convenient shopping bag size helps you cut down your use of plastic bags. Pretty Packaging. It’s Beauty Care. So why shouldn’t it arrive looking beautiful? Your Beautorium order is nicely packed in a pretty (recycled) box. All of this makes shopping at Beautorium as lovely as it is good for you, your skin and the planet. Who said Organic can’t mean luxury? 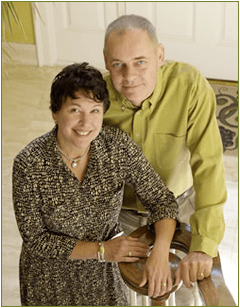 We (Ann & Barry) lived in London and Germany for over 20 years and were senior executives in the beauty industry. Ann has over 20 years experience of brand marketing and general management. She was Strategic Marketing Director of Boots PLC, responsible for Boots own brands, international operations and new businesses. Ann spent 13 years at Procter and Gamble running a number of European businesses including Olay & Max Factor, before ending as global General Manager. She was privileged to work with some of the greats, including Madonna, Mario Testino, the editors of British and French Vogue, as well as the late Anita Roddick and Isabella Blow. Barry has been fascinated by formulations for years and qualified as a pharmacist in 1978 in England. He has over 20 years experience running multi-site Health & Beauty retail operations for Boots in the UK. Barry was then Regional Manager for Thorntons plc, running over 200 stores in the UK and Ireland. He went on to run the Internet and Catalogue business for Thorntons before moving to the US. Natural and Organic beauty care (and the standards for it) are more developed in Europe. Many small, high quality brands have spent decades developing special products that are beautifully presented. Shopping is typically done in personalized boutiques and pharmacies, with knowledgeable and professional staff. We aim to recreate that environment, and bring the knowledge, passion and experience we gained in Europe to our Beautorium online boutique in America. Beautorium is amazing. I love just wandering around and looking at all the great stuff you guys offer. Keep up the great work! Win What You Love: A Beautorium blog giveaway!